While on our walk yesterday Lucy and I passed by a house on a hillside that was COVERED in creeping raspberry plants. I spotted this house last year while on one of our walks and shook my head. And I’m shaking it again this year. The berries are totally edible!!! And yet no one is picking them. It makes me crazy. 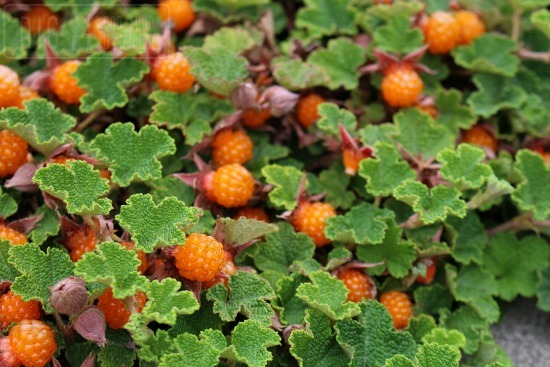 The next time I need to plant a groundcover… I’ll be planting creeping raspberries. Have you considered asking the property owner if you can harvest? Looks like a WHOLE LOTTA JAM to me. I agree with Colleen – definitely ask the owner if you can harvest these beautiful berries since they obviously are not. How large are the berries? 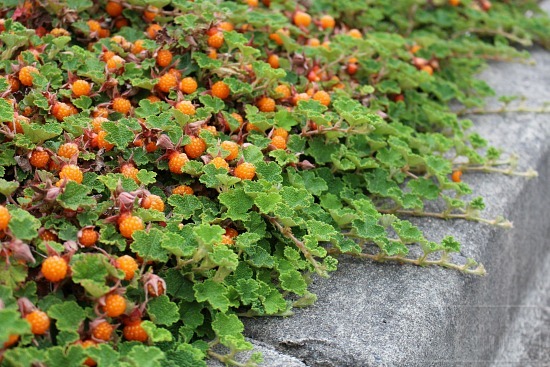 I’ve been reading about this plant and everything I’ve read says the berries are really tiny. They look huge in your photo! I second Colleen’s comment!!! You’re the one who taught us that it doesn’t hurt to ask! Barter! you pick and make the owner some jam!!!!! Amazing – I had no idea there was such a thing! They remind me of the wild strawberries we have all over our yard. They are tiny, but make a tart jam. Yummy stuff. You need to just ask before they are no good. We all hate wasted food as much as you do.. ask! 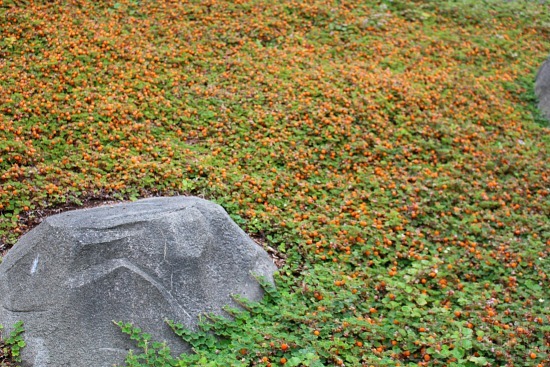 I love how you share articles you’ve stumbled across & because you’re a gardener I wondered what you think of this one. Are the creeping raspberries native? That’s become a top question in my garden though anything that gives food can have my space! I’ve never seen so many berries on a ground cover variety of rubus before. It’s glorious. I see this plant, or a close relative, all over the place though almost always without fruit, and certainly not this much. I was excited to try this in my garden several years ago as it’s reportedly drought tolerant. Complete failure. It never bore fruit and completely died after a couple of years. Boo. Maybe time to try it again. Is your area in Zoen 7 or above? We sadly live i a zone 4 area for most things so I suppose this is why I have not seen these here. I would be walking–no running–to that house and begging them to pick those berries! We live in SW Florida and I’ve spotted loaded mango and avacado trees. The owners were happy to oblige! What’s the worst they can say, no? Exactly.